Restless legs syndrome (RLS) is considered one of the many sleep disorders because it is characterized by sensations of itching, burning, or other general discomforts while you rest, making you want to get up and walk. 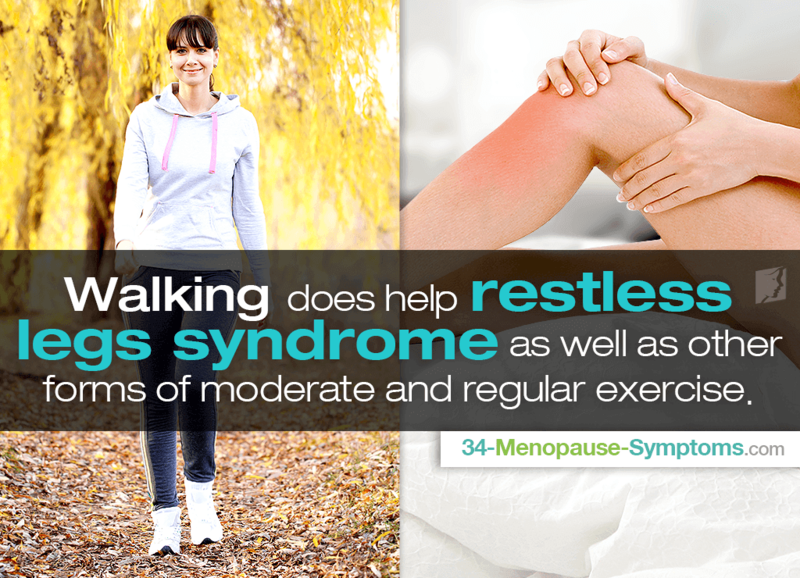 Keep reading to learn more about RLS during menopause and how walking does help restless legs syndrome as well as further treatment options. How Is RLS Related to Menopause? Perimenopause, colloquially referred to as menopause, is a time marked by hormonal fluctuations (such as estrogen), causing many characteristic symptoms. Studies have shown that extremely low estrogen levels can actually inhibit the metabolism of magnesium, which is known to have a significant role in encouraging muscle relaxation, thus resulting in RLS. Does Walking Help Restless Legs Syndrome? Walking does help restless legs syndrome, as well as other forms of moderate and regular exercise. Be sure not to exercise excessively or too late at night as this may intensify symptoms. Try taking a leisurely stroll for as little as 20 minutes a day. If you are not able to create specific times for walking in your schedule, try walking to work or pacing the office in between tasks. The key is to do it consistently, not just when you feel the symptoms of restless leg syndrome. Also, before walking or exercising, remember to stretch. Stretching will not only prevent you from injuring yourself during exercise, but it will also help to relieve your symptoms. Stretching should be done before and after to help reduce lactic acid build-up stored in your muscles after engaging in a physical activity. Women suffering from RLS during menopause are encouraged to resolve the underlying cause of hormonal imbalance for long-lasting relief. While medications are often the first line of treatment pushed for endocrine system health, there are a variety of natural and effective treatments for sleep disorders available. Click on the previous link to find out how you can finally get a good night's sleep again for years to come. Sleep apnea is a serious disorder that increases in prevalence among menopausal women. Learn more the different types, causes, and treatment. Women during menopause are more likely to suffer from sleeping problems, which can be caused by night sweats, depression, or sleep apnea.